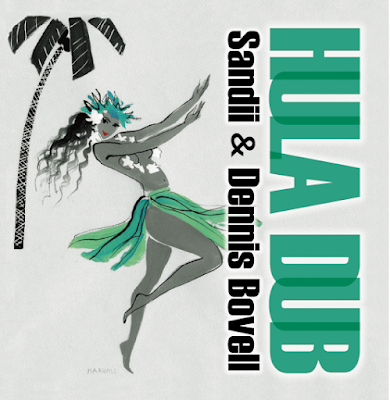 The Duff Guide to Ska: Duff Review: Sandii and Dennis Bovell "Hula Dub"
Duff Review: Sandii and Dennis Bovell "Hula Dub"
This is a fascinating collaboration between reggae producer-musician-dubmaster Dennis Bovell (Matumbi, Linton Kwesi Johnson, The Slits, Madness, Hollie Cook, Prince Fatty, Boy George, Tokyo Ska Paradise Orchestra, Alpha Blondy, Janet Kay, Errol Dunkley, Johnny Clarke, Fela Kuti, Steel Pulse, Edwyn Collins, Arcade Fire, The Pop Group, Golden Teacher) and the Japanese/Hawaiian singer Sandii, who for the last few decades has been releasing albums focused on Hawaiian and Polynesian music (in the 1980s, she was in Sandii and the Sunsetz, a Japanese synth pop band, which toured with/opened for acts like Eurythmics, INXS, Blondie, and David Bowie). The two cuts here--"Yorokonbino Uta" and "Pua Lililehua," both sung in Japanese--are a great mix of Hawaiian hula music and reggae (the results are not far from Lovers rock). Japanese dub/reggae fans should take note that Little Tempo serve as Sandii's completely ace backing band here. This one may be a little left of the dial from some, but the (slightly) musically adventurous will love this release (if you want to track this down, I ordered this through Amazon in Japan). For more on Dennis Bovell's music, read The Duff Guide to Ska reviews of his "Heaven" 12," the "Row, Row, Row" single, and the Dub 4 Daze compilation. Thanks for the post. Where can we listen to this? I enjoyed Sandii in the 80s! You can listen to samples through Amazon in Japan: https://www.amazon.co.jp/s/ref=nb_sb_noss?__mk_ja_JP=%E3%82%AB%E3%82%BF%E3%82%AB%E3%83%8A&url=search-alias%3Ddigital-music&field-keywords=sandii+dennis+bovell.